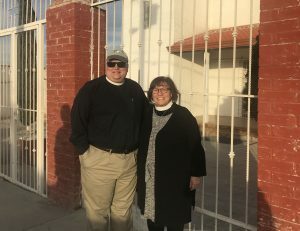 Dean Steve Thomason and Canon Nancy Ross took a journey to El Paso, Texas and crossed the border into Juarez, Mexico from Thursday December 13 through Saturday December 15, 2018. 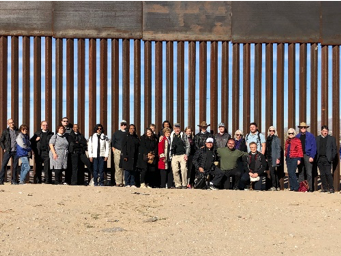 They were in a group of Episcopal clergy and lay leaders from across the U.S. who were there to learn more about the crisis at the border and how we can help. Dean Thomason shares notes from the journey here. You can also read the Episcopal News Service story on this pilgrimage here. 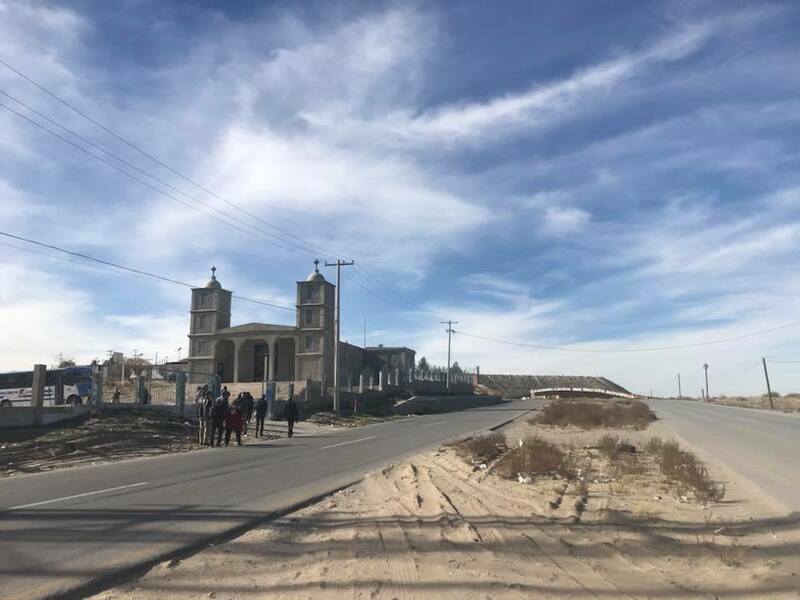 On this Feast of St. Lucia, our group of 28 Episcopalians from across the country converged on the high desert town of El Paso, Texas, in the bright and brisk afternoon of a sun-filled winter day. With brusk mountains to the west reaching up to a brilliant azure dome, we assembled in this city of 650,000, known for its multicultural flavor, its military posts, and its bridge over the Rio Grande River over which millions of people travel each year. 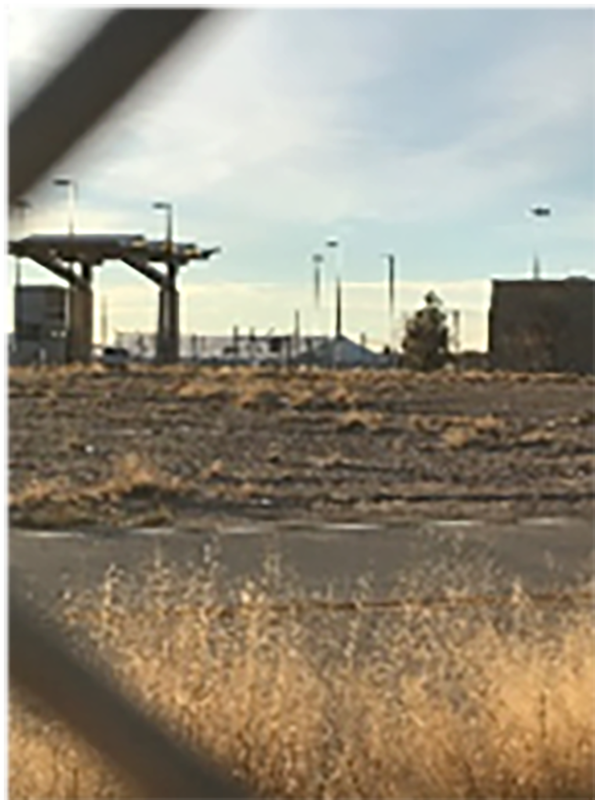 It is the second largest port of entry on the U.S.-Mexican border, and its annual volume of trade is 1.5 times larger than that of the Port of Seattle. Think trucks, not cargo ships, and you get the picture. This group of Episcopalians arose from a clergy group of which I am a part. We meet each year in the Easter season, and it is good to be with a few from that group once again, complemented by others who enrich the group with their presence. After gathering briefly at the airport hotel, we drove to Annunciation House, a remarkable ministry which has served refugees for forty years now. The director, Ruben Garcia spoke with us for about an hour, describing their efforts to ameliorate the suffering of those who’ve risked everything to flee the violence of their villages in search of a better life. Ruben took pains to share the plight of these people with us—since a recent presidential executive order declared that no one crossing the border illegally would be eligible to seek asylum (it’s being contested in court), the people who have made their exodus from Central America have come to the edge of the water of this river and are unsure how best to proceed. Many have begun simply walking onto the bridge and surrendering to US Customs and Border Patrol (CBP). In fact, so many have done this, that the CBP is now refusing to arrest them, so the refugees simply started sleeping on the bridge, waiting for the chance of being arrested and taken into US custody. The city of Juarez has opened shelters for these people (it’s 29 degrees this morning), and CBP has created a numbering system by which these people can wait on that side of the border for their day of processing to come around. But here’s the horribly frightening way that our government is doing that—they are writing the number on the forearm of the refugee in permanent black marker! (Digression: Two books worth reading: On Tyranny: Twenty Lessons from the Twentieth Century, by Timothy Snyder, and How Fascism Works: The Politics of Us and Them, by Jason Stanley). Ruben cut his time with us a few minutes short when a bus of refugees arrived, and the seats in which we sat in their cafeteria were needed to provide a meal for these hungry, weary, and obviously scared souls—mostly women and children—who had just been dropped there by ICE who has no room in their detention centers, especially if women and children are to remain together. 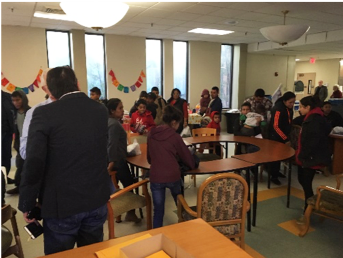 Annunciation House receives some 2000 refugees each week, seven days a week, 365 days a year, and assists them in finding family members who might sponsor them as they move through their asylum hearing process. It can take years, and any slight error can mean they will be deported. Here in El Paso, where the courts are stacked with hardline judges, just 5% of those applying for asylum actually are awarded it. The rest are returned or go underground to become part of the 11 million living in the U.S. without documentation. I have more to say about another agency and an Episcopal Church we visited last night, but will save it for my next post. 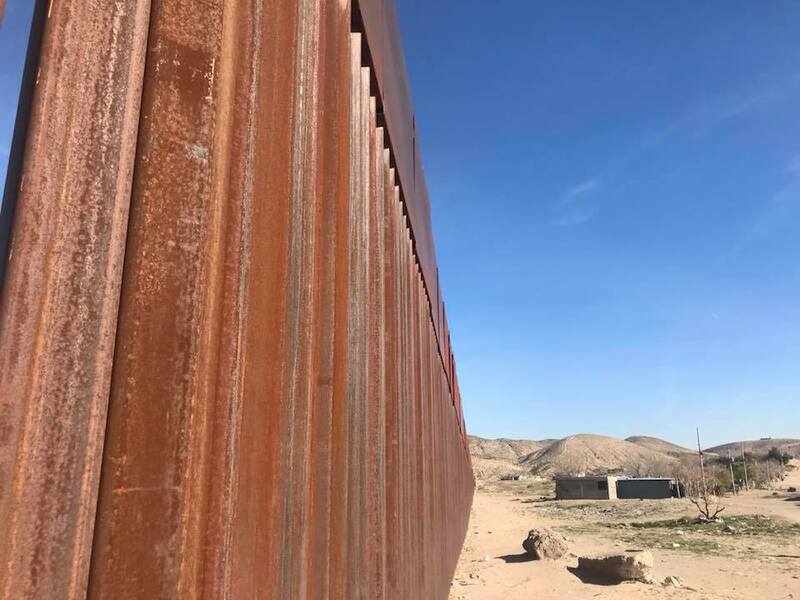 Today (Friday) we will walk across the bridge into Juarez, a town of 1.5 million struggling to meet the needs of its citizens amidst drug violence, the glut of refugees, and the delicate economic balance of this binational region. If Annunciation House draws on Mary’s narrative, as a marginalized woman who would be chosen by God to be the bearer of good news, then our next visit to Las Americas Immigrant Advocacy Center reminds us that the United States is not “America,” but rather is one part of the whole of “the Americas.” We are in this together—economically, socially, and most of all, morally as siblings. Three young women oriented us to their work—a staff member who volunteered during college and caught the vision such that she has dedicated her life to this cause, and two volunteers whose deep concern for those whom they served was readily apparent. Las Americas provides legal services to low-income immigrants and advocates for human rights. Human trafficking is an inescapable element of the refugee crisis, and we can be assured that, even as residents of Seattle and the Pacific Northwest, we eat in restaurants and we stay in hotels where trafficking of humans translates into domestic and food industry indenture, and we can be assured that we purchase goods that carry the fingerprints of this real problem with them. That’s not intended as an indictment so much as simply to say, it’s complicated, and it’s not just a “border issue.” We are all involved in the immigration crisis, whether we want to be or not. (Digression: We have an agency similar to Las Americas addressing these same challenges: to learn more go to Northwest Immigration Rights Project, www.nwirp.org. St. Mark’s member Elizabeth Hawkins also dedicates her law practice to providing legal services to immigrants, some of whom are in a detention center in Tacoma). Our last stop Thursday evening was to St. Christopher’s Episcopal Church in El Paso, where Fr. J.J. Bernal and the good people there run a soup kitchen and provide an array of support services to those starting anew in the U.S. Their hospitality ministry overflows with grace and generous good will, and we were the beneficiaries this evening, sharing a sublime meal of fajitas and all the fixings in their parish hall. After Morning Prayer, we headed to the border. Making our way into Mexico is always a breeze. They waved us through with no investigation. Two young men served as our guides, Alex and Michael, whose affable spirit and effusive welcome quickly broke through any barriers that may have existed. They guided us through the lively street scene of old Juarez, with its version of speakeasys still in operation alongside modern conveniences of farmacias, food stands, and a delightful city park dedicated to their beloved singer Juan Gabriel, who died a few years ago. 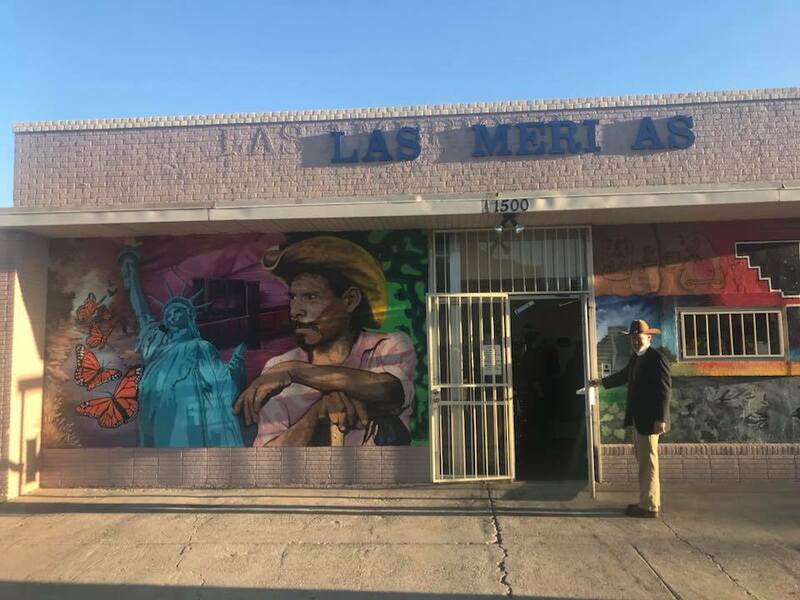 Juarez is a burgeoning city, new and old, that has swelled to more than 1.5 million residents, and countless more waiting in shelters and on the streets and in the shadows as they struggle to cross. 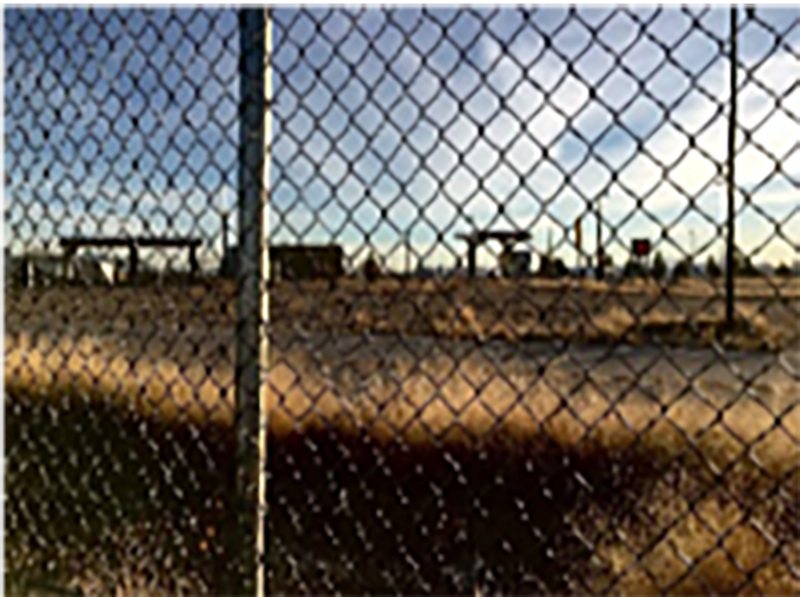 Juarez is at once a binational city (many Texas residents cross the border for work every day), but it also is challenged with drug violence fueled by the drug appetite in the U.S., street crime, and extreme poverty. We traveled by bus to Anapra, a colonia (settlement) of shanty homes and decrepit infrastructure on the outskirts of town where thousands live in squalor amid the dust made toxic by the refuse and garbage strewn everywhere. A parade of young mothers, young children, and scrappy dogs (which keep the rat population at bay) came to meet us at the nearby border wall. 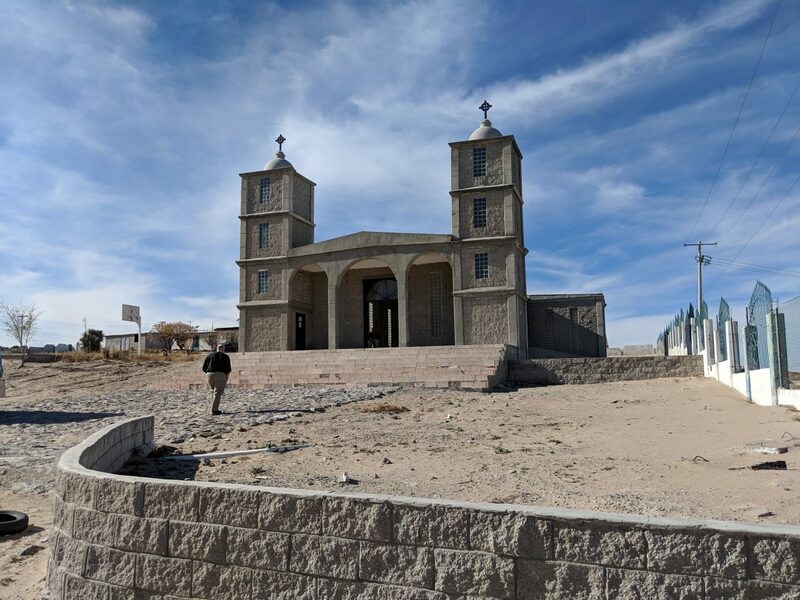 The Church of the Holy Spirit, an Anglican Church built 500 feet from the wall and this colonia, was built there with these people in mind, but there is no support network that can adequately address the social crisis of poverty on that side of the border, which has grown exponentially since NAFTA gave rise to maquiladoras (factories) making parts for U.S. goods to be assembled in the U.S. Again, it’s complicated. Fr. 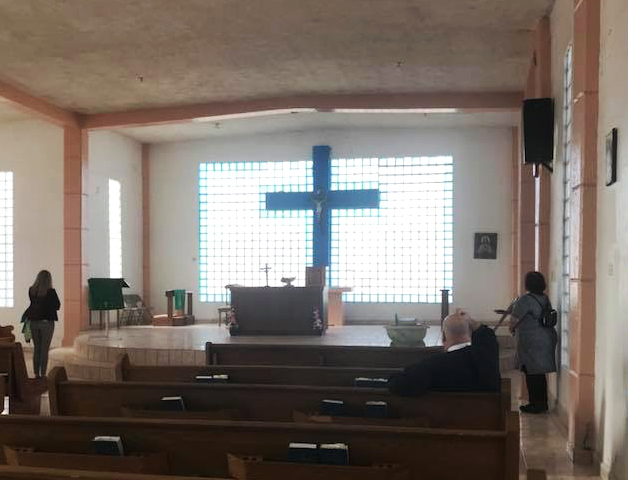 Hector, an Anglican priest serving three small, struggling churches in Juarez, including this Church of the Holy Spirit, joined us for this part of the day. From there we traveled nearly an hour to another church on the east side of Juarez in what looked like a warehouse. Hospitality is the theme down here—church members served us a lunch of bean tacos and pastries. Fr. 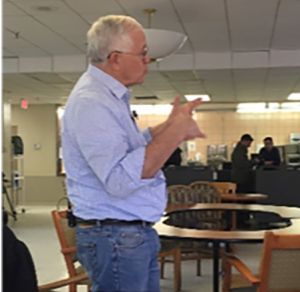 Hector shared his vision of training volunteers from the U.S. to work in a relief center being launched in the church space. There is a clear sense of resolve that the gospel mandate is one of servanthood, caring for the least, the lost, and the lonely. It took some time to make our way back across the border, to the hotel and dinner in an El Paso landmark, L & J’s Café, where our table conversation turned naturally to next steps. There are so many facets to this problem, and so many engagement points to consider. More on that later. Let me say here that one prevailing theme for these two days has been the utter grace with which our siblings in the Episcopalian/Anglican Churches here are going about their work. They are so faithful, so resolved, so hopeful in the midst of what could easily become despairing conditions, and yet they press on, and they are inviting us to consider how we might work alongside them—whether that is down here, or in Seattle. There is work to do, and they are whispering a gentle call in our direction, as Christ did to the apostles—Come and see…and follow me. Some in our group arose early this morning and traveled 40 miles southeast of El Paso, to Tornillo, a small desert town adjacent to the border where our government has established a tent city for unaccompanied minors who’ve entered our country seeking asylum. Currently there are some 2300 children living in tents, uncertain of when or whether they might be released into the custody of relatives who reside in this country, or be returned back to the violence of their villages from which they fled. 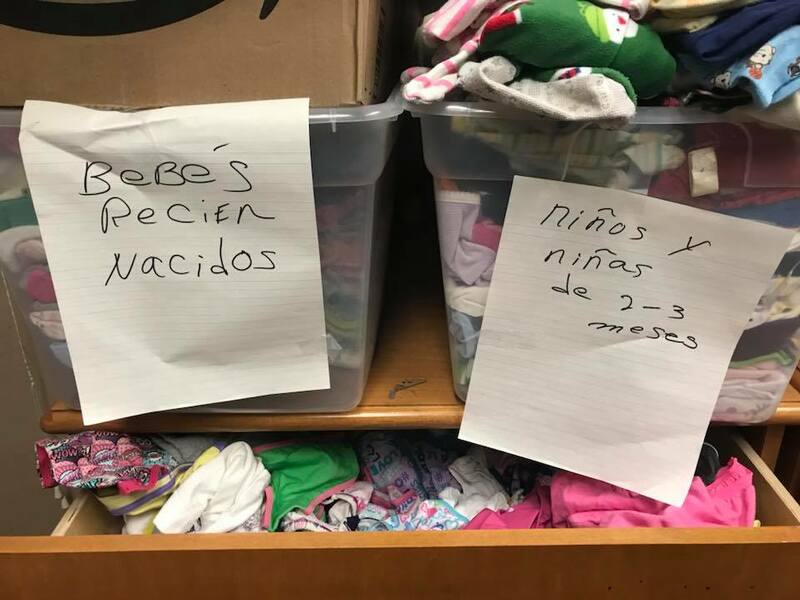 They are not in school, they have limited access to health care, and they are allowed no contact with the outside except for monitored phone calls to relatives, who may no longer be at the phone numbers they had, or may not answer for fear of deportation themselves. I did not join the group this morning, but they reported being held at a distance by barbed wire and security guards, so they stood by the fence and prayed for the children, their families, and the guards, and our nations. The full group then convened for a time to process our experience and to give some thought to what next steps might look like. Because we are here as a group of colleagues in churches across the nation, we have some ideas about collaborating with each other, and with the agencies on the ground here, who’ve invited us to respond in specific ways. We want to be sure we are responding to their invitations, guided by their wisdom in this, and the coming weeks will include continued discernment and discussion in that regard. 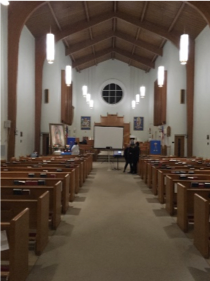 Nancy Ross and I have tentatively identified the Cathedral Commons on Wednesday January 16, 2019, 6:45-8:15 p.m. in Bloedel Hall to report on our experience this week, but more importantly, to engage those present in conversation about how we as a community of faith might be responsive in several ways. There is no expectation of commitment to be made that evening, beyond your presence and participation in the conversation. We will make our way together, and there are many ways to be responsive in Seattle and on the border. So I hope you will join us. As I board the plane to return home—and home is not just the safe and warm dwelling of the deanery, but also the company of family, and the community of Saint Mark’s—I have a profound sense of gratitude for the liberties I enjoy, and a sense of grief that we are living in a time of intense fear-mongering that affects people in terrible ways. I bid your prayers and inspired action as servants of Christ, who is as likely to come into the world this Christmas season as a refugee as anywhere. I will leave you with a poem written yesterday by the sister of a priest here on the border who shared it with us during our prayers before crossing the border. Sanctuary at Saint Mark's | Saint Mark's Pledges Support for Immigrants and Refugees | What does the Bible say about immigrants and refugees?